Memories of summer camp . . . Some of my best summer childhood memories come from attending Girl Scout Camp. Although I can’t recall the name of the camp I do remember Mrs. Andrews our leader. I remember the tents were perched on platforms and there were four girls to a tent. I bunked with one of my best friends Martha Kopec and two other girls from another troop. You were not supposed to keep food in your tents (bears and tigers and lions Oh My!) but who didn’t smuggle snacks in their footlocker? I loved swimming in the pool, the nature hikes and going to the dining hall for arts and crafts . . . the tie-dyed T-shirts, weaving your own place mat and the leather bracelets made with the punch tools. Of course what summer camp would be complete without singing Kum Bye Yah around the campfire and eating smores?! 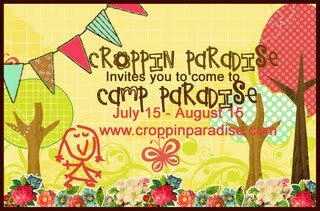 So whether or not you had the opportunity to attend summer camp as a child you have the opportunity to experience Camp Paradise by joining in the fun from July 15th – August 15th at Croppin Paradise. Join the Design Team Counselors as we provide challenges, games and prizes and a month full of fun scrapping projects!